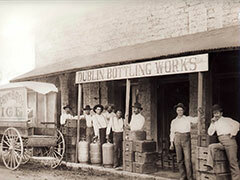 The history of Dublin Bottling Works begins in 1891, but the real story begins a few years earlier and 80 miles to the east. In 1885, the wild frontier town of Waco, Texas, was nicknamed “six-shooter junction.” Wade Morrison’s Old Corner Drug Store was a prominent business and popular meeting place in downtown Waco. People came in for everything from flea powder to stationery, from cigars to fountain drinks. Bill Kloster never studied marketing. The words goals, objectives, strategies and tactics weren’t part of his vocabulary. He didn’t promote his product from a textbook; he did it from his heart — a concept that would have left marketing gurus cringing. Except that it worked. Bill Kloster operated on instinct that was so on target that his tiny Dr Pepper franchise was continuously among the top 10 producers in per capita consumption. Bill knew his business. He started at the bottling plant when he was 14 years old — a job necessitated by the death of his father and his need to help support his mother and four siblings. For the next 67 years, including the day he died, he put in long, hands-on hours, focusing on quality control, community involvement and his own unique style of sometimes blustery, sometimes covert public relations. 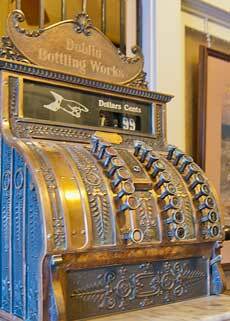 Bill started as a bottle sorter for 10 cents an hour. He got his first painful lesson in economics when he dropped a pallet of glass bottles. After the damages were deducted from his paycheck, he took home mere pennies — his first paycheck. Before long, plant owner Sam Houston Prim took the young man under his wing, becoming a surrogate father as he watched Bill grow into manhood and into a self-styled promoter of Dr Pepper. From the bottle sorting chores, Bill worked his way up to production manager. After a tour of duty in Europe during World War II, he returned to become general manager of the plant, which was then operated by Prim’s daughter, Grace Prim Lyon. Mrs. Lyon died in 1991 on the dawn of the plant’s 100th birthday celebration, leaving the Dublin plant in Bill’s capable hands. When bottom line indicated the tiny Dublin plant should give up pure cane sugar in exchange for less expensive corn sweeteners, Bill wouldn’t budge. He continued to subscribe to the country theory of “dancin’ with who brung ya,” refusing to change the recipe that always gave his local product its unique taste. The story was widely told that when his wife Iona told Bill he was drinking too much sugar and should switch to the sugar-free variety, he secretly had the regular Dr Pepper put into diet bottles and stocked in his home refrigerator. at the corner of S. Patrick Street and E. Elm Street in Dublin, Texas. Residents of the community and the region enthusiastically support what they consider “their” Dr Pepper. But Bill was no less enthusiastic about giving back. Seldom does a community event take place without Dr Pepper, usually provided as a donation to a worthy cause. 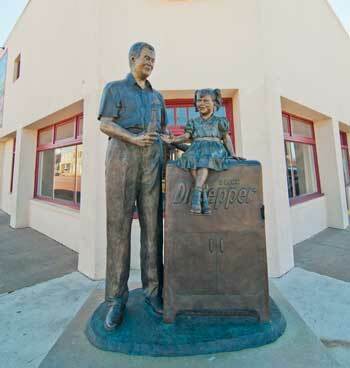 Most of the major projects in the area had a Dr Pepper signature somewhere, even though many of Bill’s contributions were done inconspicuously and, by his choosing, without fanfare. 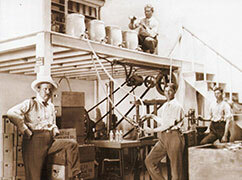 Bill always spent long hours at the Dr Pepper plant. 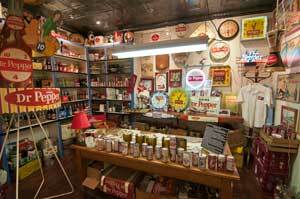 But in 1995, following the death of Iona Kloster, his beloved wife of 54 years, he dedicated himself to the expansion of the museum collection and the promotion of Old Doc’s Soda Shop. The years took no apparent toll on Bill mentally, but he deeply resented the physical limitations caused by arthritis. He wore out the knees he came with, and several replacement knees as well. He rarely fussed about the pain, but often griped about the inconvenience, particularly when he had to take time out for surgery and rehabilitation. In the summer of 1999, he underwent his last knee surgery. As he began the therapy which would put him back on his feet, he suffered a severe heart attack, followed by several more. His doctors were not optimistic about his survival, much less his recovery. But miraculously, Bill survived and returned to work, leaping headlong into the development of the commemorative 2000 calendar. He wanted this millennium calendar to be a tribute to the four young ladies who have worn the title of Pretty Peggy Pepper, his favorite advertising icon. Bill died suddenly on Sept. 27, 1999, after a full day at the bottling plant where he had spent the day approving designs for this 2000 calendar. He is gone only in the physical sense; the echo of his chuckle and the shadow of the wide grin that accompanied his favorite Dr Pepper stories will always be felt. Bill Kloster was a man of conviction. 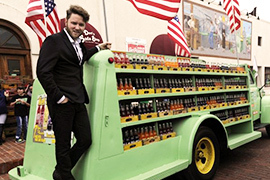 The tiny, independent Dublin Bottling Works still produces pure cane sugar sodas just like the company’s founders did more than 120 years ago. Bill wasn’t afraid of bucking marketing trends because he believed in the unique quality of his product. No, it wasn’t the textbook way of doing things. But it was Bill Kloster’s way.